It was incredible. On August 6th they were thirteen and one half games out of first place. By September 21st the Seattle Mariners were in sole possession of first place in the American League Western Division. The California Angels had collapsed The Mariners had climbed. It was one of the greatest pennant drives in major league history. For 63 games of that spectacular baseball season, The Kid, Ken Griffey, Jr., sat on the bench with a broken wrist. Some called him The Natural. Many considered him the best all around baseball player alive. Yet, he sat on the bench. The first part of that season left him out of the line-up. His frustration grew. His desire to help his team could be indulged only through cheers and encouragement. Then came that late season charge. Ken Griffy Jr. finally took the field. He played like tomorrow no longer existed. Number 24 sailed across center field making one spectacular play after another. Swinging the bat, his offensive production placed fear in opposing pitchers. And then, in the eighth inning of game 159 in a 162 game season, he stroked a grand slam against the Texas Rangers giving his team a 6-2 victory. With only three games left in the season the Seattle Mariners had closed to within two games of first place. The miracle was under way. When regular season play came to an end, the Mariners had drawn dead-even with the California Angels for first place. The Division Pennant would hinge on a one game play off — my boys and I were there. My two sons and I love to sit in the Kingdome when the Mariners are making baseball history. Watching Number 24, The Kid, perform sometimes takes our breath away. During that pennant fever stretch of ‘95 we were sucking wind big time! I still recall when Ken Griffey, Jr. hit the big leagues. He decided his number would be 24. Of course. Why not? For baseball fans the number 24 occupies special significance. Another great player also wore number 24. He too was a center fielder. He too punched home runs like clock-work. He too possessed speed and skills like few others before or since. He too was referred to as the Kid — “The Say Hey Kid.” His name was Willy Mays. It seems to make sense. A boy grows up playing America’s game. He watches his baseball heroes and dreams of following in their cleats. In his teen years, his parents and coaches know something special is about to explode. And in his mind he longs for the day he might wear his favorite player’s number and play the game like his favorite player plays. Huh!? Rickey Henderson? At first the reporters were stunned. Then it all began to make sense. During the 50’s, 60’s and early 70’s, Willy Mays was the greatest in the game. Rickey Henderson grew up idolizing him. As a result, he chose to wear number 24. Then Rickey broke into the majors. Through the late 70’s, 80’s and still in the 90’s Rickey too had left fans in awe. He still owns the single season and all time base stealing records. 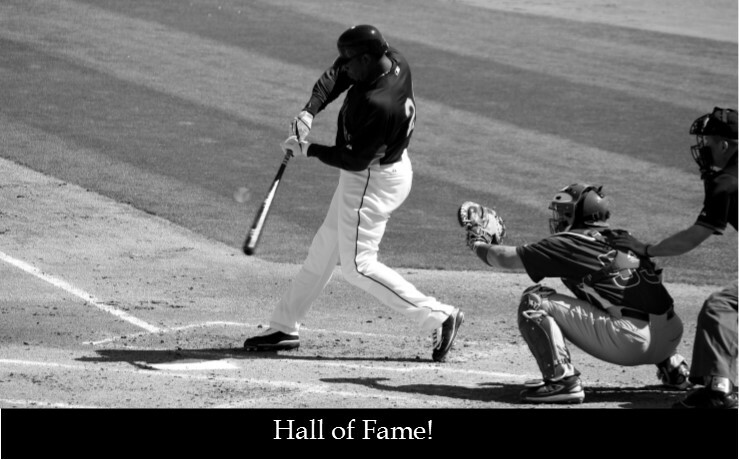 Guess who grew up watching him from afar — Ken Griffey, Jr.
Three generations of baseball players. Each wears the same number — 24. It’s a legacy — one man’s tribute to another. How about you? What do you intend to pass along? What will your legacy look like? The Bible talks about legacies. In the Gospel of John, we read, On the evening of that first day of the week, when the disciples were together, with the doors locked for fear of the Jews, Jesus came and stood among them and said, “Peace be with you!” After he said this, he showed them his hands and side. The disciples were overjoyed when they saw the Lord. Again Jesus said, “Peace be with you! As the Father has sent me, I am sending you” (John 20:19-21). And Paul wrote to Timothy, “And the things you have heard me say in the presence of many witnesses entrust to reliable men who will also be qualified to teach others” (2 Timothy 2:2). That’s the number I want to wear. That’s the legacy I hope my children will receive. That’s what I want my kids to think about after I’m long gone. I want them to know that Dad was all about Jesus. And I hope that when we all get to heaven they will have passed it along to their children. Ken Griffey Jr. was my baseball inspiration and hero all through my many years of that wonderful game till the day I was injured. To this day I love the game. So much so was my childhood baseball hero impactful on my mind that I took on the number 24 like him.